In this paper, we show that the simple bulk phase synthesis of silver(n-alkane)thiolates, (AgS(CH2)nCH3), involving drop-wise addition of a silver salt to a solution containing equimolar amounts of long-chain alkanethiol and triethylamine, can be accurately described in terms of a hierarchical self-assembly process involving two major steps. First, strong coordination between Ag+ and RS- ions causes the organization of the inorganic constituents into domains of two-dimensional, quasi-hexagonally symmetric planes, with long aliphatic chains extending to either side of the inorganic lattice. Second, the three-dimensional complementary stacking of these organic-inorganic domains results in the formation of highly organized bimolecular chain assemblies. The characteristics of these assemblies as determined by a joint X-ray diffraction and infrared spectroscopy study14 support the proposed mechanism of hierarchical self-assembly. Evidence indicates that the initial coordination pattern of the Ag-S lattice controls the structure of the layered, bimolecular material, such as the formation of a three-dimensional network of one-dimensional channels, or corridors; and the all-trans chains extending vertically from the inorganic slabs. It is found that these features are independent of chain length, and our data are self-consistent for aliphatic chain lengths of 5, 6, 9, 11, 15, and 17 methylene units. Pillared, layered organic-inorganic (O/I) materials synergistically combine the formerly unique properties of purely organic or inorganic materials. Altering the coordination behavior of the inorganic constituents and the functionality of the organic constituents enables the creation of layered materials with widely varying properties such as membrane-mimetic architecture, nano-porosity, ,, non-linear optical behavior, charge storage and transfer, , and ferromagnetism. These materials are typically prepared by intercalating organic moieties into a layered, inorganic host. A benefit of intercalation-based synthesis is that the inorganic surfaces guide the assembly of the organics with little rearrangement of the native structure. However, an inherent drawback to this approach is a lack of molecularly covalent hybridization; rather the material is typically held together by electrostatic or other attractions. Further, precise organizational control and stability is limited by kinetics, contaminants, and competing dispersive interactions between the inorganic layers. Investigation of covalently-bound, cooperatively assembled, molecularly hybrid O/I materials is the next logical step, as they uniquely offer the possibility of high stability and precise substituent and defect control. Examples of such co-assemblies are common in natural systems and in solid-state crystal engineering, but are rarely produced in the scientific laboratory. Dance and co-workers first reported, in 1991, the formation of organo-substituted silver thiolates formed as insoluble precipitates upon simple addition of Ag+ ions to a basic solution of short-chain or aryl substituted alkanethiols (RSH). Based on X-ray diffraction data for different chain substitutions, Dance suggested the material consisted of periodically stacked bimolecular organic assemblies and Ag-S backbones, a structure suggestive of O/I materials prepared by intercalation. Subsequently, the authors of the present paper have reported the detailed characterization of long-chain silver(n-alkane)thiolates (AgS(CH2)nCH3; n = 5, 6, 9, 11, 15, and 17). The series of X-ray diffraction (XRD) and Fourier-transform infrared (FT-IR) spectroscopy data provide a robust basis for the assertion of a hierarchical, cooperative self-assembly mechanism. A schematic depiction of the features verified by the study is shown in Figure 1. The structural conclusions substantiate the assumptions made by Dance and co-workers in their x-ray determination of the intralayer Ag-S slab structure. Data verify that the aliphatic chain organization is not determined exclusively by van der Waals interactions between adjacent chains. Instead, the three-dimensional organic organization is decided by the coordination geometry of the Ag-S inorganic sheet and by long-range CH3-CH3 interactions. A two-step, hierarchical self-assembly is supported by the FT-IR spectroscopy and XRD results, involving primary self-assembly of the inorganic core to produce quasi-two-dimensional modules which subsequently self-assemble in the third dimension to produce the pillared O/I silverthiolates, as shown in Scheme 1. All n-alkanethiols (CH3(CH2)nSH, n = 5, 6, 9,11, 15, and 17; &gt; 97 % purity) were obtained from Aldrich (Milwaukee, WI) and used without further purification. Water was deionized (&gt; 18 MW -cm resistivity) and scrubbed of organic contaminants in a Milli-RO, milli-Q purification system (Millipore, Bedford, MA). AgNO3 was obtained from (Bio-Analytical Systems, Inc., W. Lafayette, IN). Triethylamine (99.5 %) was obtained from Fluka Chemical Co. All other solvents were HPLC grade quality from Aldrich and used as received. Glassware used was cleaned, prior to each use, using NoChromix (Aldrich) solution in conc. sulfuric acid (Baker Analyzed Acids), washed thoroughly with copious amounts of deionized water, and dried in a glassware oven maintained at ~150 C. Many of the details of sample preparation and characterization have been published elsewhere;13, brief summary is provided here. To an equimolar mixture of an n-alkanethiol (4mM) and triethylamine (4mM) in acetonitrile, silver nitrate solution (4mM), also in acetonitrile was added in a drop-wise manner at a constant rate of addition (0.3-0.5 mL/min). The solution mixture was held under constant stirring at room temperature during the reaction period (12-15 h). Exposure to laboratory light was minimized by maintaining all reaction vessels wrapped with several layers of Al foil. Upon the formation of CH3(CH2)nSAg, the solution turned highly turbid in all cases. After standing for 4-6 h, the precipitate was collected by suction filtration, repeatedly washed with acetonitrile, and then dried for several days under vacuum at room temperature. The collected powder was stored in a dry atmosphere until use. The color of precipitates varied between preparations, but always carried a shade between opaque brown and bright yellow. In our hands, dried compounds of long-chain silver thiolates were never white. The compounds appeared highly insoluble in all typical organic solvents up to their boiling points including hexane, ethanol, tetrahydrofuran, ether, acetone, toluene, trichlorobenzene, and carbon tetrachloride with the exception of hot toluene which appeared to dissolve all compounds, though sparingly, upon vigorous stirring for several hours. The density of all the compounds, determined by immersion in different density liquids (sink-and-float method), was found to be in a narrow range of 0.86-0.88 g/cm3 was. Elemental analyses (Galbraith Laboratory) (average of 2 samples for each compound, all constant within 1-2 wt. %) of selected compounds gave the following values. (1) n=15: (Obs.) C, 52.41; H, 9.19; S, 8.93; Ag, 28.58% compare to the calculated values: C, 52.60; H, 9.04; S, 8.76; Ag, 29.58% . (2) n=11: (Obs.) C, 45.73; H, 8.08; S, 10.47; Ag, 37.35% compare to the calculated values: C, 46.60; H, 8.09; S, 10.35; Ag, 34.95% and (3) n=9 (Obs.) C, 41.49; H, 7.47; S, 11.58; Ag, 36.22% compare to the calculated values: C, 42.7; H, 7.47; S, 11.38; Ag, 38.43 %. Infrared transmission spectra were obtained using a Fourier transform spectrophotometer (Bruker Optics, Gotingen, Germany) operating at 2 cm-1 resolution with an unpolarized beam striking the sample at normal incidence. The beam diameter was controlled at 8 mm by an aperture placed adjacent to the sample. The resulting interferograms, obtained by co-adding between 50 and 100 scans, were Fourier transformed with triangular apodization and zero-filling to increase the point density by a factor of 4 for accurate determination of peak-positions. The sample consisted of essentially transparent pellets prepared by pressing a mechanically homogenized mixture of the dried solid with nominally dehydrated pure KBr in calculated quantities. The spectra were referenced against the spectra obtained for air or blank KBr pellets under identical spectrometer condition and geometry. All spectra are reported in the transmission absorbance units, [A = -log(T/To)], where T and To are the emission power spectra of each sample and reference, respectively. For accurately resolving overlapping peaks and precise determination of peak positions, second derivative [-d2(A)/dn2, n = wavenumbers] spectra are also reported. The data analysis was performed using Grams 32 (SpectraCalc) software for peak-fitting and analyses. X-ray diffraction patterns were obtained on a Rigaku Geigerflex diffractometer (with Dmax-b controller and a vertical goniometer) using Cu Ka (1.541871 &Aring;) radiation and a graphite monochromator. The samples were prepared by packing ~5 mg of solid in a standard cavity mount. Digital data were obtained for a 2q range of 5 to 70 at an angular resolution of 0.02 with a total counting time of 2 h.
The infrared vibrational spectroscopy and X-ray diffraction data presented here provide unambiguous verification of the proposed hierarchical self-assembly mechanism. FT-IR spectroscopy is a highly sensitive probe of the local molecular structure of the aliphatic chains allowing for a detailed characterization of average chain-conformational properties and packing arrangement. An analysis of inter-layer structure using XRD data, together with the spectroscopic results, provides a comprehensive characterization of chain-molecular assemblies, which in turn confirms a two-step assembly. The organic phase of silver(n-alkane)thiolates is shown to be composed of periodically stacked, two-dimensional bimolecular assemblies of conformationally, orientationally, and translationally ordered alkyl chains separated by inorganic Ag-S lattices. Each chain layer incorporates periodically spaced 1D channels or corridors. This general picture is consistent with the features implied in the schematic of Figure 1, and details of the structure such as chain-conformation, packing, and interdigitation are discussed below. The presence of these features supports the mechanism of hierarchical self-assembly as shown in Scheme 1. In particular, they show that the chain assemblies are slave to the coordination patterns of the Ag-S lattice backbones. This chain structure has meaningful implications in asserting the hierarchical self-assembly of silver(n-alkane)thiolates. Because the results for chain lengths n = 6-18 are completely self consistent within errors of resolution (2 cm-1), a similar kind of primary self-assembly is required. In acetonitrile, the long-chains of monomeric thiolate will experience van der Waals interactions and steric hindrances that vary directly with chain length. An assembly mechanism driven by in-solution aggregation and linearization of aliphatic chains and the subsequent ligation of silver with thiolate would at best have erratic success, and more realistically would result in small, unstructured oligomers. The presence of a highly structured, correlated organic matrix in the case of all samples in this study demonstrates that an identical primary mechanism of assembly, independent of chain length, is required. The primary coordination of silver with thiolate requires the linearization of aliphatic residues in order to most efficiently fit the substituents into the small space taken up by the quasi-hexagonal Ag-S lattice as can be seen in the skeletal structure in Figure 1. Powder X-ray diffraction (XRD) data provides quantitative descriptions of inter- and intralayer structure in organic-inorganic layered compounds. The intra-layer structure provides the packing characteristics of both the inorganic and organic matrices, while the interlayer structural attributes provide characterization of the uniformity and layer thickness. It was found that the crystals of silver(n-alkane)thiolate are composed of 6-11 correlated bilayer stacks along the interlayer periodicity, and ~60-70 translationally correlated C-C-C planes along the intralayer periodicity. Further, the FT-IR spectroscopy evidence given above was used to constrain the XRD data analysis, thereby yielding a rigorous elucidation of the inter-layer chain structure. Diffraction data across the entire AgS(CH2)nCH3 series revealed strict monotonic dependence of interlayer spacing with the number of chain-methylenes. It was found14 that each methylene group added 1.25 &Aring; to the interlayer distance. Using the bond-lengths and angles derived from tabulations of covalent and van der Waals radii for the idealized model, we calculated a chain-length of 1.253 (± 0.002) &Aring; per CH2 group, and an average chain tilt of 0-5&deg; . Additionally, the Ag-S lattice has a finite thickness of about 0.42 &Aring; which is independent of the thiolate residue. This implies that the inorganic planes are puckered in the fully assembled molecule, and so the silver-sulfur interactions are not fully planar. Indeed, the currently accepted model of a triply bridging Ag-S lattice in primary chain substituted silver thiolates suggests that the Ag-S slab is at least ~1.0 &Aring; thick with S atoms extending 0.5 &Aring; on either side of the Ag plane.13, The incorporation of the inorganic lattice's thickness into our calculations resulted in an estimated period thickness 0.58 &Aring; larger than experimental. We interpret this difference to quantify the extent of overlap between the CH3 groups of the contiguous layers in the bimolecular assembly, which can be seen in Figure 1. This overlap, or interdigitation of the end methyls of opposite organic faces in the layered O/I structure, verifies a hierarchical self-assembly mechanism. If the primary step in the self-assembly is that of the two-dimensional building blocks, then long-range CH3-CH3 attractions can cause their secondary stacking, stabilizing the material by isolating the internal layers. The small but non-vanishing interactions between the methyl residues further indicate that Ag-S driven two-dimensional formation is the preferred mechanism, else far deeper penetration of one organic plane into another would be possible (see below). Characterization of a series of long-chain silver (n-alkyl) thiolates, synthesized using reaction of alkanethiols with silver nitrate from their dilute basic solution reveal the formation of a pillared layered structure composed of distinct Ag-S inorganic slabs separated by ordered bimolecular assemblies of alkyl chain substituents. The presence of inter-chain voids and small interdigitation between the chain-assemblies of adjacent layers suggest that the observed packing of the alkyl chains does not represent the most efficient packing of chains. Rather, in combination with the result that these data are consistent across the entire series of chain lengths, it appears to reflect geometric constraints imposed by the integral Ag-S inorganic core. 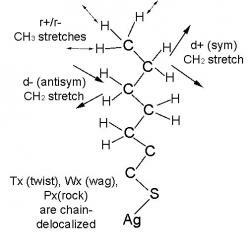 This suggests a complex formation mechanism - one in which the organization of the chains plays a secondary role to the strong coordination propensity between S- and Ag+ - leading us to believe that the crystallization mechanism in silver thiolates must occur in hierarchical steps. We acknowledge the help of P. Haridoss and F. Garzon in obtaining X-ray diffraction data. Undergraduate research was supported by the Underrepresented Minorities and Females (URMF) and the Undergraduate Research Semester (URS) Programs. This research was supported by Los Alamos National Laboratory. Scheme I: A Schematic depiction of the proposed hierarchical self-assembly mechanism for the formation of long-chain silver thiolates. The primary self-assembly involves the organization of the molecular precursors to form a quasi-2D Ag-S lattice with the alkyl groups extending on each side. The latter 2D building blocks stack subsequently in the third dimension to generate the pillared layered AgSR structure.